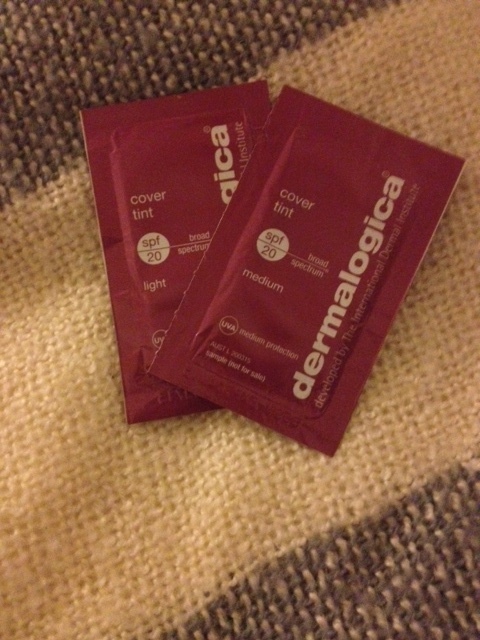 Many years ago I was to be obsessed with Dermalogica’s Treatment Foundation. I loved how it was so light on the skin, yet still had a good coverage. I didn’t feel like I was putting anything ‘bad’ on my skin. I only stopped using the Treatment Foundation because I moved and struggled to get my paws on it. After a few weeks of sulking, I bit the bullet and started using other foundations. But in all honestly, I have always had a massive soft spot for the Treatment Foundation! When my skin went crazy, I decided to nip to the Dermalogica store in Dubai Mall and pick up a Treatment Foundation. To my absolute HORROR, I was told it had been DISCONTINUED !!?? What? Why? I do not understand why anything that good, would be discontinued !? I was advised to try a sample of their new Cover Tint. Apparently it was just like the Treatment Foundation. I was given a light and a medium to try. The next day I was SO EXCITED to get it on my face. Really! I squeezed some of the ‘light’ onto the back of my hand and immediately noticed that it wasn’t very light at all. It looked pretty orange to me, but… I blended it into my face to see how it would look. I still thought it wasn’t the greatest colour. It also felt slimy. I instantly did not like it but always feel everything should have a fair chance. I wore it the entire day, and the next day. By this point, I made my final decision. This foundation didn’t work well for me. I have oily skin in Dubai and it didn’t help with that at all. My skin felt tacky and a gust of wind left me with sand stuck to my face. The colours are poor and the formula doesn’t blend particularly well. It also starts to sit in the creases of the face throughout the day, which is never an attractive look. Unfortunately I wouldn’t recommend this. I hope they eventually decide they made a terrible mistake and bring back the Treatment Foundation. Why mess with perfection?? Have you tried it? I would love to know what you thought! This entry was posted in acne, beauty, beauty blogger, blemish, blemish control, blogger, blogger award, blogging awards, caroline hirons, cover tint, dermalogica, dubai, dubai mall, evening routine, expat, face treatment, fashion, makeup, sephora, skincare, spots, treatment, uae and tagged acne, beauty, bespoke, blemish control, blogger, caroline hirons, clear start, concealer, cover tint, Dermalogica, dubai, dubai blogger, dubai mall, expat, face treatment, foundation, makeup, new, newbie, sephora, skincare, spot treatment, spots, treatment oil. Bookmark the permalink.